Since the 1980s in Italy reflections on sexuality and identity have been taking the form of a net. It is a network made up of multiple groups and individuals who put at stake their own bodies, using them as critical territories to go beyond borders, barriers and fixed frames of thinking. In this view, sexuality becomes an open and playful radical communication code, as it is no longer based on the gender opposition (male/female), but is expression of a flowing entity, able to manifest itself through a network of widespread and reticular links. The importance of experiment with body and sexuality on territories that are beyond the limits, can be traced in pink networks of tactical and playful strategies. "Queer" is the best term to connote these practices, crossing the limits of sexual stereotypes. In Italy, queer digital communities and gender activists are closely connected to those of the hackers. They are part of the same network and share a similar approach to technology. By emulating the hacker way of combining and recombining hard- and software into a more critical and all-encompassing technology, they want to subvert rigid cultural paradigms and create new interstice cultural zones for themselves. A collaborative cut-up, or cultural collage, combines hacker ethic, political activism and independent sexual culture. Tatiana Bazzichelli, a.k.a. 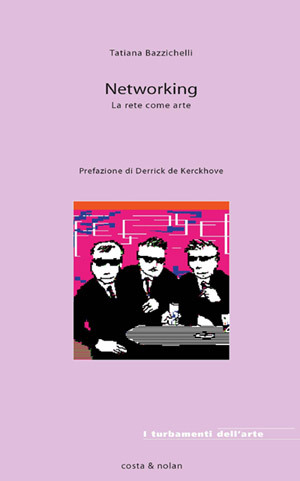 T_Bazz (Roma, 1974), is a Communication Sociologist and an expert in New Media Art, Hacktivism and Net Culture. She gave a dissertation on Italian interactive digital art at the University la Sapienza in Rome (1999). She holds a M.A. Degree in New Media and Communication, with a specialization in Digital TV, achieved in 2001 at the University of Rome Tor Vergata. In 2002, she attended an High Formation Course on Management of Arts and Culture at the Scuola Normale Superiore of Pisa. In 2000-2003 she worked as Content Manager and Multimedia Project Planner for the Web-Company KSolutions of l’Espresso Editions Group / la Repubblica newspaper. Towards the end of the 1990’s she organised events and conventions, such as Cum2Cut (Berlin, 2006), Hack.it.art (Berlin 2005), Art on the Net in Italy (Berlin 2005), MediaDemocracy and Telestreet (Munich, 2004), AHA (Rome, 2002), Hacker Art Lab (Perugia, 2000). Founder of the networking project AHA:Activism-Hacking-Artivism (2001), she manages the aha@ecn.org mailing list regarding artistic activism. She is a free-lance journalist and writes of art, media and new creative trends for "AD-Architectural Digest", "Next Exit", "Digimag", "Tk-Off". She wrote articles and reviews published on "Flash Art", "Neural", "Avatar", "Noemalab", "Cluster", "Cut-up", "XL" of la Repubblica newspaper. She wrote "From Telestreet to Hackmeetings: the network of information creation" for the editor Costa & Nolan, in the book Neo Television, Elements of Glocal Cathode Language, edited by M. Pecchioli. Since 2003, she lives in Berlin, Germany. This work is licensed under the Creative Commons Attribution-NonCommercial-ShareAlike License.